At the Politiclub meeting, Democrat Andy Clark, runner for Senate in District 37, chats with the NC students, engaging them in the conversation. The audience asks interesting questions to keep the discussion going as Clark introduces himself and goes over his campaign goals. 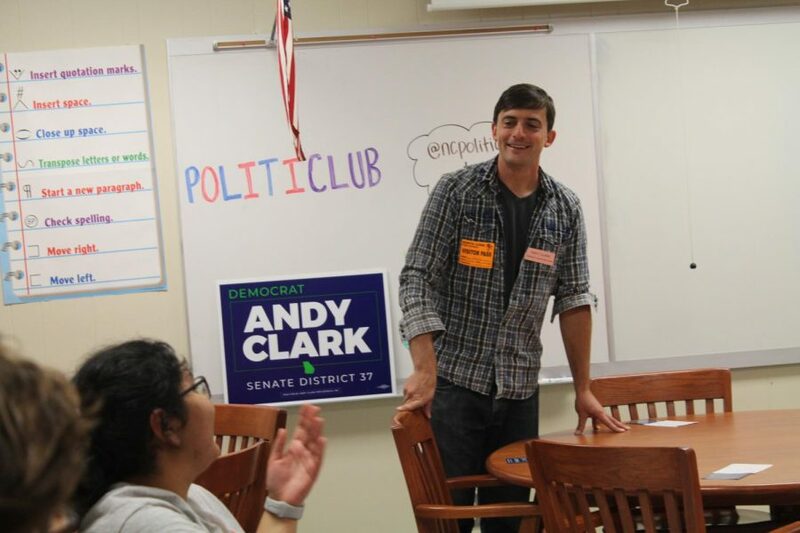 Politiclub invited democrat Andy Clark to come in and speak to NC students interested in politics on Friday, September 9. Attending with his campaign manager, Austin Gates, Clark introduced himself as a runner for Senate of District 37 in Georgia. “I met Mr. Clark a couple weeks ago and I admired how real he was. When people hear ‘politician,’ they think of people in fancy clothes with articulated speech who are ‘too good’ for the common folk. 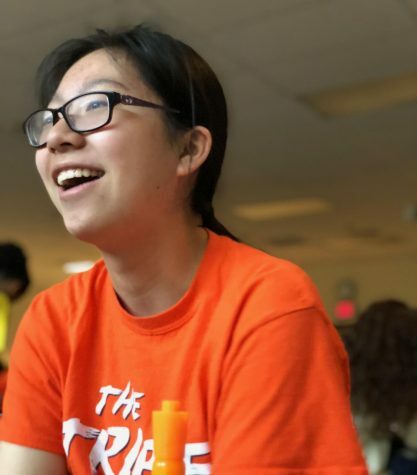 Mr. Clark is down to earth and speaks to others respectfully, without looking down on them,” Co-president and junior Taylor Catlin said. Clark started his speech off by telling the audience about his background, including what school he attended and what led him to pursue his dream of becoming a lawyer and now a member of the Senate. “I went to Rice University in Houston, and right after I went to the University of Chicago’s law school back when president Obama was a professor there. I worked as a lawyer at big law firms for a while and then I started to teach. I was a teacher at law school for several years in New Orleans,” Clark said. The club members kept the discussion going as Clark explained his main priorities as a senator. Everyone participated in the conversation while the democrat discussed his plans and solutions for current issues, including gun laws and Medicaid. “Health care is the biggest one I think. Medicaid expansion is something I think Georgia really needs. There’s a lot of extra money that’s being given to the states for their Medicaid programs. Georgia is one of the few states that have been refusing to take the Medicaid money from the federal government,” Clark said. Even though Clark led the conversations, the eager students took turns asking him questions about his campaign and how he plans on making a change in the community. “I would consider this meeting a success. We had several people in attendance, all of which asked interesting questions that provoked discussion with Mr. Clark. Our goal is to enhance student knowledge about current politics and I believe we did just that,” Catlin said. Republicans previously held this seat, but by reaching out to a new group—young people— Clark hopes to make a change and get people to vote for him in the upcoming election. 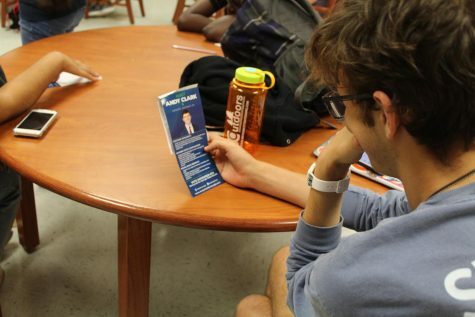 Intrigued, an NC student examines Andy Clark’s campaign brochure while he listens to Clark talk about his plans on changing the community as Senator. Clark hopes to convince the young community to spread the word and vote for him in the upcoming election. “Although not all of the people in attendance could vote, they all learned about a potential senator who may be representing them in the future. They learned about the inner ways of politics and what issues are central to Georgia, and they can pass this information to their parents and their peers,” Catlin said. Politiclub meets every other Friday afternoon in room 609, next to Mrs. Theaker’s room. The next meeting will be located in the same place on Friday, September 14.